I got a new-fangled phone shortly before my kids died. Let me tell ya, it's not all that and a bag of chips. It's a phone, camera, internet browser, etc with a qwerty keyboard, but it's not really a good phone. So I recently pulled out my old phone and remembered that I have many, many pictures of my kids stored on it. I was only supposed to be able to store about 35 pictures, but for some reason I never ran out of memory so I have close to a hundred. Today I started sending them to my email account one by one (there's no easier way to do it...I already asked). 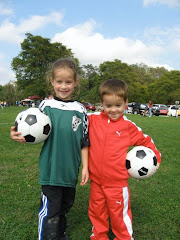 I found this adorable picture of them from October of 2006 and wanted to share it. Thank you for posting these, Lady. They bring a smile to my face and a tear to my eye - so telling of how I feel when I think about them, and I'm sure you as well. I hope to get a chance to scan some more of the ones I have soon, too. Just beautiful (and sad) - your words - your photos (what a find!). I noticed the train too, and did not know Peter then, but noticed it because one of my little guys does the exact same thing - always has something in his hand - "Stickers" from Cars - Thomas - a little Puppy from a Happy Meal :-), etc. I had never met any other little one who did that. Love it! What beautiful children. I am so sorry. Truly.